So, you know, I'm not picky or anything...Thus far only a few products have met my nitpicky expectations, checking off a majority of the list. And I'm happy to say there's now a new brand that has met my crazy standards — the beautiful 14e cosmetics. Created by makeup artist Emma Fortini (who used her last name as inspiration for the brand's name), 14e's products use Aloe Vera as a base in lieu of water, adding in other goodies such as Licorice Root, Gotu Kola, and non-nano Zinc Oxide to round it out. Currently, the brand offers two different products, their Aloe Nourish Foundation and, for lighter coverage, the Aloe Sheer Tint. I've been testing out both of these beauties for a solid month now, and cannot emphasize how impressed I've been by both. Let's start off with the Aloe Nourish Foundation, which I've been using in the shade Sand-02* (a shade that is just a tiny bit too light for my tanned summer skin). This creamy formula blends in easily, drying down to a semi-matte finish with medium coverage, with an added boost of SPF 23. Instead of emphasizing dry patches, this formula manages to highlight without ever looking oily, even in the most humid of temperatures. While I find that you can still see some blemishes or acne, this formula still packs a serious punch of coverage, which easily will last you throughout a long day. In fact, in terms of coverage, I'd rank this evenly with another favorite of mine, Gressa Skin's Minimalist Corrective Serum Foundation. While 14e's offering is far more creamy versus Gressa's oil base, the coverage they both provide is similarly natural and buildable. While I've been loving the foundation I have to admit that, of the two, it's the Aloe Sheer Tint that has stolen my heart. For the past month or so, I've been using the shade Bamboo-03* nearly daily for a bit of coverage that feels nearly weightless on the skin. But, while I'd place the Aloe Sheer Tint firmly in the "tinted moisturizer" category, I've been pleasantly surprised by just how much coverage this hydrating gem provides. With a finish that I'd describe as being satin-matte, this is the perfect formula to slap on and go about your day. Blending in just a few drops of this (whether it's with your hands, a beauty blender, or a brush) leaves behind what I can only describe as healthy, natural-looking skin. Will it cover up blemishes or breakouts? Not so much, but it will certainly provide more benefits and coverage than many other tinted moisturizers on the market. 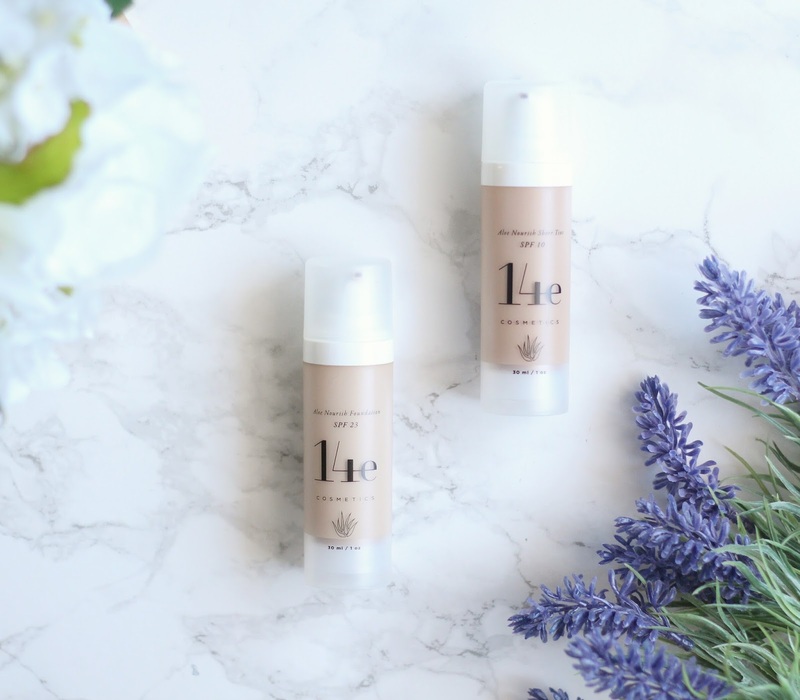 Have you guys tried either product from 14e cosmetics yet? If not, I implore you to check out the brand's gorgeous Instagram, which features so many amazing pictures of girls looking gorgeous wearing the Nourish Foundation and Sheer Tint. Seriously, I already own both and yet somehow these pictures make me want to just stock up on each of them for life!